The mosque on 58 Beacon Road in Kliptown claims to be Soweto’s oldest mosque. It is midday on a Friday and the maulana (Muslim religious scholar) issues a wailing call to prayer from Kliptown Masjid. Devoted Muslim brothers come from all around Soweto – Kliptown, Eldorado Park, Dlamini, Pimville, Phiri – to give praise to Allah in this house of worship that lays claim to being the oldest mosque in Soweto. 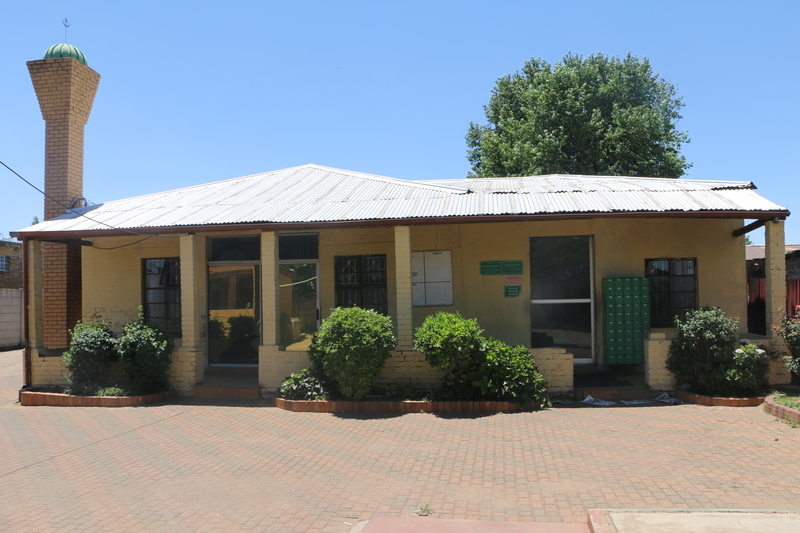 Located on number 58 Beacon Road Kliptown, the mosque has been in this very spot since 1940. “However, even with such a long history in the area, the Muslim religion still faces serious hostility from community members,” says Rashad James a frail looking 60-year-old man who has been attending mosque in this building since 1963. This may not come as much of a surprise since Soweto, like most of South Africa, is predominantly Christian. However, Kliptown in particular is inhabited by mostly migrants who themselves have relocated from other provinces. Yet “they still see Islamic people who have been worshiping at this mosque longer than some of them have been in the area as foreigners, taking no regarding of how the mosque has been and continues to be a place of solace for many migrants in the community” this according to some congregants at the mosque. 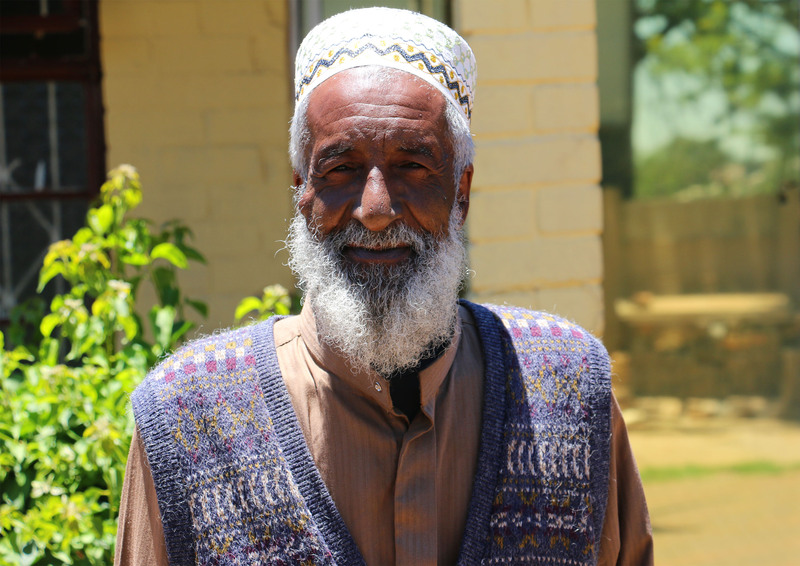 A WEALTH OF WISDOM: Rashid James the longest serving congregant at the mosque. “Allah-hu-Akbar (Allah is great)”, repeats the maulana five times. At the sound of the first call James stops mid-sentence and rushes back into the mosque from a bench he had been sitting on that leans against the front of the mosque. There are two entrances to this weathered house of worship, both positioned symmetrically in front of the building. The 1.90 meter tall, lean built James with a bushy grey beard dashes for the entrance closest to where he had been sitting – his shoes are already off and left side by side at the entrance of the mosque. Here, dozens more shoes are lined up awaiting their owners who have gone into the mosque to worship. His right foot goes in first, then his left. He had earlier explained that this is a sign of respect for “Allah’s house” in reference to the mosque. Aesthetically the mosque epitomises the old-fashioned architecture of early Kliptown. One could mistake it for any one of the original houses built in the Kliptown area in 1903 subsequent to the township having been laid out in 1891. The area is located on a portion of the Klipspruit farm, named after the klipspruit (rocky stream) that runs through it. Actually, “The mosque operates from the same building structure which was a house owned by a Jewish family built in 1903. It was given to Muslim worshippers in 1940 by the owner when he left the Kliptown area,” James had earlier explained. There are two features that set it apart from the other original houses that haven’t been refurbished since their construction. These features are the mosque’s green minaret (dome) which has a crescent moon and star on top as well as a distinctive three meter tall pole with two microphones attached to it situated in front of this house of worship. Passers-by cast curious glances at the mosque as those coming to perform sallah (offer prayers to Allah) continue to pour in. They are either fascinated by the maulana’s loud call to worship resonating from the loudspeakers or the distinctive regalia donned by these faithful. Taqiyah (rounded skullcap) and thobe (an ankle-length garment, usually with long sleeves, similar to a robe) are what most of these Muslim men are dressed in. Another possibility is that the passers-by are captivated by the unfamiliar greetings of “As-salamu alaikum wa-rahmatullahi wa-barakatuh” (May the peace, mercy, and blessings of Allah be with you)”, met by the response “wa-alaikum-salaam wa-rahmatullahi wa-barakatuh” (and upon you be peace, mercy and blessings of Allah). As the mosque fills up with devotees coming to worship, what they leave behind gives an account of who attends Friday prayers. They all follow the Muslim practise of leaving their shoes outside the mosque as a sign of respect for the “…holy house. Even in the Christian bible, when Moses came across the burning bush, the command he got was for him to remove his sandals as a sign of respect,” explained James. The majority of footwear left behind is made up of formal shoes and sandals – clearly belonging to the older men who are no longer chasing after trends. In the midst of this not so stylish apparel, there are jaw dropping kicks that range from labels such as Puma, Nike, Adidas, and Jordans clearly belonging to the more youthful Muslim boys. WEAR AND TEAR: Pairs of shoes lined up outside the mosque awaiting their owners. 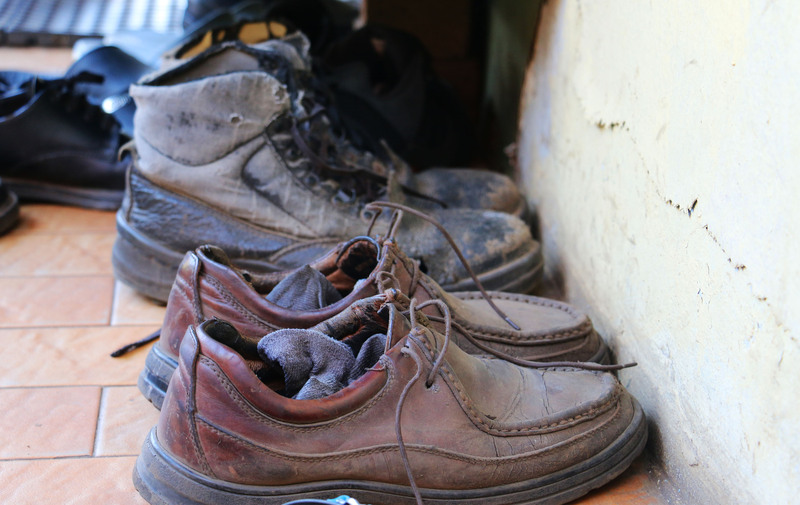 Some of the shoes are dusty, the owners have most probably walked from far to come and give prayers. There are no feminine shoes left outside so one can tell that Friday prayers are mostly attended by men. “A typical mosque has a section for males and one for females but because we are still using the same building structure build so many years ago, our particular mosque does not have these separate sections hence women worship from home,” said James. “The Muslim religion in Kliptown is almost as old as the township itself since people from Cape Malayan decent most of whom are Muslim settled in the area as far back as the township itself was started,” said a reminiscent James. “My father then later moved to Johannesburg in search for work and still maintained the Muslim religion taught to him by his father,” added James. 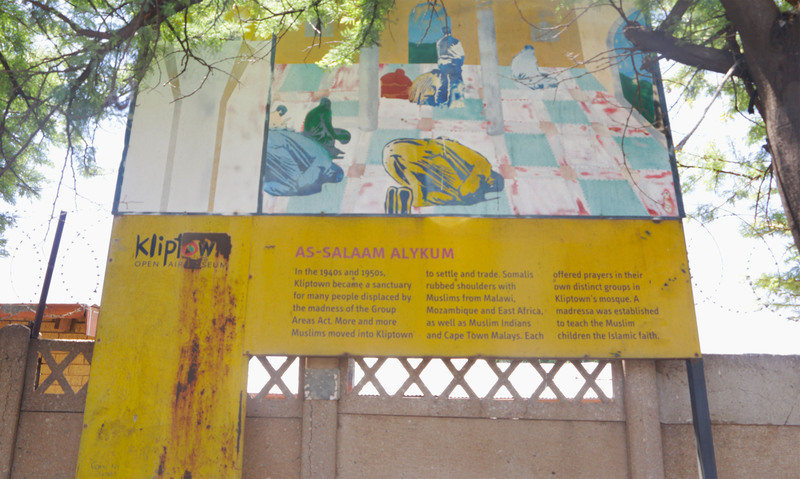 These misconceptions that Islam in the townships emerged in the 1970s may be drawn from the fact that the Soweto Muslim Association was only established in 1978. This association was founded by Sayed Ali Zhange, Adam Ali Koko, Walid Ndebele, Muhammed Ali Mvelani, Faizel Morris, Babu Magudielo, Babu Chauke and Haroon Mbombi. The caretaker of the mosque, an enthusiastic Issa Hashim, however, agrees with Fakude. “From the fifties to the seventies there was an influx of foreign nationals especially from Malawi, Angola and Mozambique coming to worship with us at the mosque,” he said. As the processions in the mosque comes to an end, the congregants start pouring out and each stops at the spot where they left their shoes and puts them on. The old James is one of the first to appear, he standout in his all white taqiyah and thobe and distinctive white woollen glove on his left hand. He joins me back on the bench leaning against the front of the mosque. He then goes on to explain how he is an asylum seeker from Uganda who was forced to leave his country of birth due to political persecution in 2002. “I started coming to this mosque in 2005. I was accepted with open arms by fellow Muslims who worship at the mosque but it’s not always the case with the larger Kliptown community,” says Ibrahim who avoids eye contact like it’s a plague. Like most townships, Kliptown has had its fair share of xenophobic violence. Ibrahim attests to this, although no physical harm has befallen him, the emotional strain of seeing other brothers being victimised and their shops physically broken into or even torched takes its toll on him. “The mosque has been a place of solace, were I can come to offer prayers and have peace even while I go through life’s numerous storms,” says Ibrahim. IN COMMEMORATION: A plaque in recognition of the mosque’s long existence. Ibrahim explained that, “Stereotypes that Islam is an Indian religion or that it is only foreign nationals that practice it is due to lack of knowledge.” In order to educate the community, the mosque holds madrassa [the teaching of Muslim tradition] usually targeted at young children in the community who wish to learn more about the religion said Hashim. “As congregants, there has been a plan to demolish this old building in order to rebuild a mosque that will be able to accommodate the growing numbers of people that attend. However, since this building is the oldest mosque in Soweto, it has been designated as a historic site making the rebuilding almost impossible,” explained Hashim who has now managed to wiggle some space on the bench next to James. According to the city council the expansion may only take place when the shack dwellers have been relocated to RDPs. “Besides, if they [Muslim worshippers] are allowed to build a bigger mosque, it will attract more foreigners to our community as most Muslims are not form South Africa,” added Mathebula. However, all three Muslim men agree that the problem is not their religion, “The issue is the scapegoating of the mosque and those that worship in it as an attempt at finding solutions for this community that has been so neglected by government. If the government fulfils its duty of providing housing and sanitation to the community, then the mosque would have its land back and would be able to rebuild and continue teaching Muslim tradition to young community members and assisting foreign nationals affected by xenophobia,” said James. The maulana is the last to exit the house of worship, as he walks but the three men also stand and finish putting on their shoes, “Wadaeaan (goodbye),” they say and head their separate ways.